Limericks Bill Kurtis reads three news-related limericks: Cheesy Baby, There's A Snake In My Bootcamp and Wedspread. Bill Kurtis reads three news-related limericks: Cheesy Baby, There's A Snake In My Bootcamp and Wedspread. Coming up, it's Lightning Fill In The Blank. But first, it's the game where you have to listen for the rhyme. If you'd like to play on air, call or leave a message at 1-888-WAIT-WAIT - that's 1-888-924-8924. 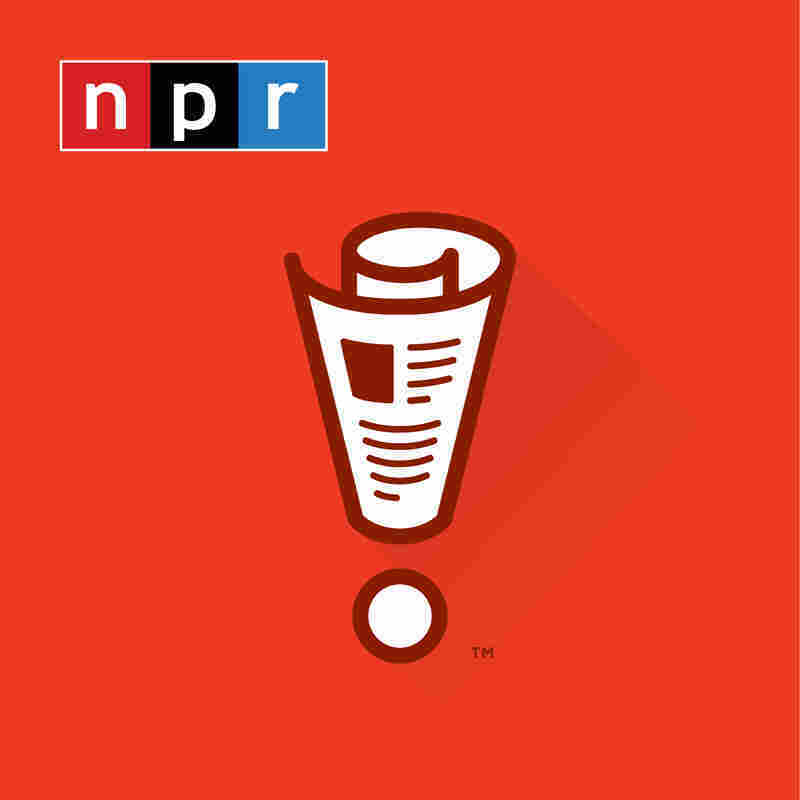 You can click the contact us link on our website - that's waitwait.npr.org. There, you can find out about attending our weekly live shows right here at the Chase Bank Auditorium in Chicago and our upcoming show February 7 in Savannah, Ga. And if you don't want to leave the house but still want some WAIT WAIT action, you can play our new interactive game on your smart speaker. Just ask your Alexa or Google Home to open the WAIT WAIT quiz, and Bill and I will be there with you - just the three of us - and you might even win a prize. ALEXANDRA DAVIS: Hi, Peter. I'm Alex, and I'm in Lafayette, Colo.
SAGAL: Well, now, I know Colorado well, but I don't know where Lafayette is. Where's that? DAVIS: Lafayette is 10 miles due east of Boulder. DAVIS: I work - I actually work for the city of Aurora, and I manage their water resources division in the water department. SAGAL: Oh, wow. Well, water resources out there in Colorado - that's pretty serious stuff. Do you have to fight people off with weapons? SAGAL: Alexandra, welcome to the show. Bill Kurtis is going to read for you three news-related limericks with the last word or phrase missing from each. If you can fill in that last word or phrase correctly in two of the limericks, you'll be a winner. You ready to play? DAVIS: Yes. I am so excited to play. SAGAL: All right. That's great. We're excited to play with you. Here is your first limerick. SAGAL: Gender reveal parties are all the rage, meaning they're everywhere, and they make people very angry. SAGAL: ...With their patented, exclusive gender reveal lasagna. If you're having a girl, the cheese in the lasagna, once you cut it and expose it, is pink. And, of course, if you're having a boy, the lasagna is full of sausage. ADAM BURKE: Because there was a story - I don't know if you've heard of this - at least a couple times, one guy started a wildfire. SAGAL: Oh, we were all over that story. BURKE: But that's the thing. All these things reveal way more about the parents than about the children. It's not a gender reveal. It's a moron reveal party. BURKE: It turns out you shouldn't have bred in the first place. SAGAL: It is a gym for snakes. SAGAL: The Melbourne Zoo in Melbourne, Australia, has created the snake gym to help their chubby snakes lose some weight. Can you imagine how tough it is to lie about your diet when you're a snake? SAGAL: Like, no, I didn't just gobble down four mice. And your friends are, like, oh, we can see them. SAGAL: One, two, three, four. It'd be nice to have - the great thing about having snakes in the gym - now you have a great reason not to go. BURKE: Oh, man. That's - whenever I eat a vole, it goes straight to the part of me that's not my head. SAGAL: Exactly. Yeah. Bright side for snakes using a gym is that they don't have to spend a lot of money getting, you know, getting an outfit. Like, no, I don't need yoga pants. Just one tube sock, please. I'll be on my way. SAGAL: All right. Here is your last limerick. SAGAL: If you thought true love was dead in this sad, cold world, a woman in England is marrying her blanket - something that isn't actually alive. DICKINSON: And they're not talking about, like, Michael Jackson's kid. DICKINSON: This is an actual blanket. BURKE: It's actually made me really rethink Linus from "Peanuts." ADEWUNMI: Did you say she's from England? SAGAL: She's from England, so she calls it her duvet. DICKINSON: (Imitating British accent) Yes, correct. ADEWUNMI: We never call them blankets. ADEWUNMI: That makes it all right. SAGAL: Her name is Pascale Sellick, and she says, quote, "My duvet is the longest, strongest, most intimate and reliable relationship that I have ever had," unquote. If things go well, in about nine months, she'll have a new set of dish towels. BURKE: She - I think she - I heard about this. She knew that things were getting serious with the duvet when she no longer put the cover on it. SAGAL: Bill, how did Alexandra do on our quiz? KURTIS: Congratulations. You got all three. SAGAL: Thank you so much, Alexandra. DAVIS: (Laughter) Thank you. Bye. FOREIGNER: (Singing) I want to know what love is. I want you to show me.